CBD Skunk Haze® comes from a project between Dutch Passion and CBD Crew. The goal was to achieve a CBD rich variety useful for medical growers. For medical use low %THC is preferred for some medical patients who want a relaxing and high quality genuine cannabis effect without the intensity that some high THC varieties give. Recreational users find that high CBD levels give a very comfortable and smooth high without anxiety or paranoia. Ratio of CBD:THC is between 1:1 and 4:1. Usually the CBD is present in greater quantities than THC. To create this variety our Haze/Skunk (winner of the 1992 High Times Cannabis Cup) was carefully crossed with a high CBD variety. CBD Skunk Haze® produces large tall plants. This Sativa/Indica cross (50/50) produces large buds which are not too dense. The aroma and taste are of spicy cedar wood alongside tones of citrus, pine and mint. CBD Skunk Haze® grows well Indoors and in a greenhouse. The flowering period is approximately 10 weeks and yields up to 450 grams/m2 are possible under ideal conditions. I cultivated the skunkhaze for my mum and dad who are suffering from chronic pain. The seeds had a 100% germination rate, i added to their number by cloning them and going sea of green with about 2 dozen plants under 4 x 600watts. The yield was fantastic, i harvested >750g of dried material (that includes sugar leaves) which i turned into tincture & oil for my parents. My parents reported a significant reduction in pain after using the oil / tincture. I have a bunch of Legal Medical CBD skunk haze growing indoors now via DWC. Vegged for 6 weeks now starting flower. Each plant is easily 3.5 feet tall. Used a 600watt MH 20/4. Is there a coffeeshop in Amsterdam listing that weed or any other cbd rich strain? Do you think will grow outdoor in the subtropics? I have been a medical marijuana user to help with chronic pain, due to a crushed vertebrate injury obtained playing ice hockey. Recently a friend of mine grew some of these CBD Skunk Haze seeds from Dutch Passion and gave me a bit of finished flowers to try out. I was amazed at the pain relief properties of this strain. The pain relief set in almost immediately upon vaporization, and gave me significant if not complete relief from the pain. It lasted almost 2hrs. The high from the flowers was very minimal or nonexistent which is ideal for regular daily use. The pain relief was the best I have ever experienced from medical marijuana. I will start growing this strain immediately. How many weeks do you advise to let this strain flower after vegetation? The first seed company to offer a high CBD auto will be shocked by the demand awaiting. Aloha, my name is Alex and I'm an asipiring organic farmer living on the garden island of Kauai. I also have my medicinal marijuana license! :p Here on Hawaii, those of us with licenses can grow 7 plants at a time. My most recent harvest was profound to say the least. I grew 1 cbd skunk haze. By far the most healthy and vigor lady that I had growing. I had her in a 15 gallon geopot along with 2 pigeon pea plants (nitrogen fixing 'soldiers') The geopot was filled with worm castings and fox farm's ocean soution potting soil. I also enriched the potting soil with mycorrhiza, biozome, sea90, azomite, biochar (that I produced) and I utilized the full spectrum of products from the company Growers Secret. My ladies were grown in a greenhouse that I crafted with drip line irrigation, timers, and misters. I decided to dry the harvest in my cottage along my sliding glass door where the trade winds literally are always blowing through. After 6 days of drying them in the trade winds at nights than moving them into my closet during the day. I begin curing. I used a 1 gallon mason jar. Long story short, this strain is by far the most aromatic and pleasant smoke and high that I have ever experienced. I am so enthusiastic about this strain and the potential of enhancing it by utilizing the way I build and 'engineer' soil and grow plants and synergizing this with the thriving climate and weather conditions found only here on Hawaii! OVCM - thanks for your review. In a greenhouse at 55 Latitude you would probably be looking at a finish in November. You asked a good question about the ruderalis hybridisation, it is something we are looking at, keep following our website news and blog for more updates on our CBD work. hello, first off, in the past i was more of a hash smoker as i smoke daily and don't enjoy the 'top-heavy' high i get from weed, as well as the occasional perceptual distortions. this herb is, in my opinion, near perfection. i do not find the taste remarkable, but the high is so well-balanced, so fluid. it's not a 'lets get real high' weed, but an enjoyable, organic, functional smoke. i get anxiety and feelings of guilt from being too stoned to do anything, i do not get this with this herb. i still enjoy a bit of kush every once in a while but for the regular, this herb is excellent, good in the morning, good at night, good alone, good at socials. my questions to DP: 1. would hybridizing this species with a ruderalis not make the weed even higher in CBD? seeing as ruderalis has no thc but quite a bit of CBD? 2. 10 weeks flowering, at 55ºN, when would this be ready in outdoor greenhouse? 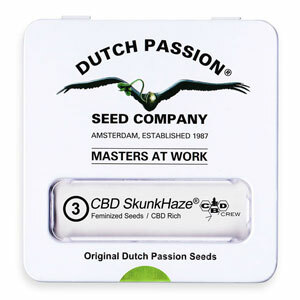 Any chance of buying these seeds from a shop in the Netherlands/Amsterdam? I've been buying SkunkHaze today ... really amazing, what information i find about it. I really gonna hope, that the medical usage will be accepted! Here's my question: Is it possible to grow this CBD rich sort also outdoor? I will test this as soon as possible. i suffer from chronical pain desease, so i give it a try because herb with high cbd normally has the best effect for pain release for me. unfortunally i have very limited space for growing. so a bonsai autoflower variation would be perfect for me. in the moment i prefer a sort called "royal dwarf". it is ready in only two months, its only 60cm high when it is ready . a small autoflowering sort with high cbd and low thc would be perfect for many people who use it for medical reasons.you have it fast,you dont need much space to grow it.that would be just perfect! not everybody has a glasshouse or a garden. or much space.especially when you live in a concrete jungle:-( so please think about working in this direction. Hi Sean, at the moment we do not have sufficient quantities of CBD seeds to stock all our re-sellers, so for now they are only available via our webshop. But we expect in 2013 that we will be able to increase availability. We hope to have enough for re-sellers soon. Please keep checking the Dutch Passion blog for the latest info on our CBD work. How do I get skunk haze to hawaii? You do not ship to the US through your shop and the attitude and others that do, do not even list this variety. I like a good toke, but I’m not what one would call a heavy stoner. I don’t normally smoke in the day and I don’t usually toke pure. Even though I ‘m not a tobacco smoker, I’ll have a little bit with a joint sometimes in the evening. Anyway, it was a cold October afternoon when I travelled to Bristol to meet Howard Marks, Des Humphrey and Reuben MC, so it would be rude to turn down a spliff. Des passed me his CBD Crew Skunk x Haze neat spliff, so I thought well a couple of tokes won’t hurt, though I didn’t want to have too much as it was still early in the afternoon. The first thing to notice was the pleasant taste; I’ve toked pure joints many times before, which have often resulted in an instant coughing fit, but this was a smooth nice tasting spliff. The effects came on quickly; a very pleasant cerebral high, with no edginess that you can sometimes get if you blaze on a pure skunk spliff using some of the skunk that is often grown for the UK black market; I believe this is because a lot of skunk on the UK market is not harvested properly resulting in high THC and low CBD. The effects were long lasting, even though I only had a few puffs. It was when we left the hotel building and went outside I really noticed just how pleasant this skunk x haze was. I felt a real clarity of thought in my head; I felt uplifted, confident and happy. I tried some more later and got proper stoned, but never so I didn’t feel in control of what I was doing or saying. Everything about this weed is nice, the taste, the smell, the effects, the look, you know it’s going to be nice as soon as you see and smell it. I’m not a medicinal user of cannabis, but after smoking this, I felt medicated. Recreation is medication, so if you smoke Skunk x Haze, even if you have no specific medical needs you will feel medicated after smoking this amazing herb. I’ve smoked a lot of varieties of cannabis over the years and I have to say this is one of the nicest I’ve ever tried both in taste and effects. I like the strong effect, but also that it didn’t mong me out; a great tasting strong skunk that gets you stoned without being overwhelmed. I have a little bit more and I certainly will not be mixing this with tobacco; I’ll toke it pure again, I think it would be sacrosanct to mix this beautiful strain with tobacco. A stone where you are stoned, yet can still function, my kind of weed 10/10 – I cannot speak highly of it enough. Spent all Sunday afternoon walking around Amsterdam and none of you approved dealers had any stock - when is this going to be available in retail?